Whether you own or manage an office park, store, shopping center, factory, multi-unit residential building or other commercial building, finding a good commercial electrician to provide quality electrical installation services and repairs is important to the safety of your building, your employees and your customers. Commercial electricians in Alameda County specialize in providing installation, repairs, maintenance and troubleshooting services for electrical systems in commercial buildings and public areas. They are often skilled in testing, repairing and maintaining electrical systems in existing buildings and can provide installation services for new commercial buildings and to upgrade old commercial electrical wiring. Good commercial electrical services will be able to diagnose electrical problems, provide ongoing maintenance and even offer lighting solutions and upgrades for older electrical systems that are no longer meeting your needs. How can you find the best commercial electrical company in Alameda County for you, whether your commercial building is located in San Leandro, Berkeley, Hayward, Alameda, Fremont and Oakland or another area? That’s where research comes in. The articles below will help you learn the basics about commercial electrical contractors and what you’ll need to know before hiring one. You’ll find helpful interview questions, tips and suggestions for vetting, researching, hiring and working with commercial electricians in your area of Alameda County. Don’t wait until you experience an electrical emergency before researching good commercial electricians in Oakland, Fremont, Hayward, Berkeley, San Leandro, Alameda, Union City, Pleasanton, Newark and Dublin and beyond. You’ll be much more likely to find a good commercial electrician that meets your needs and expectations if you take some time before an emergency or large remodel or new construction to research and learn about local electricians who serve commercial buildings in Alameda County. Start by interviewing a few local commercial electrical firms near your business. Learn about the services they provide and the customer service they offer clients. You may even want to hire them to provide some small electrical repairs or upgrades to your office, store, shopping center or public building before you rely on them for an expensive or large-scale project. 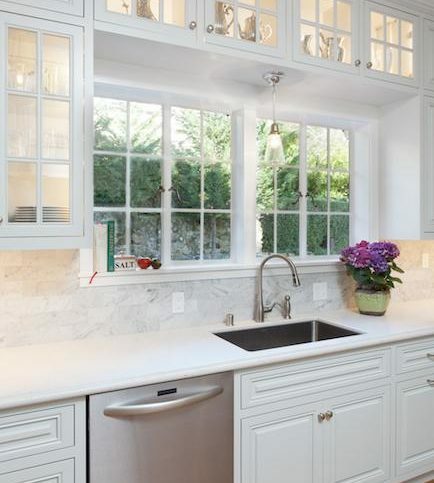 This way, you will be able to see the quality of the work and personal service without committing to them for a long-term project or expensive upgrade. When researching Alameda County commercial electrical companies, keep in mind that cost shouldn’t be the main factor on which you make your choice. 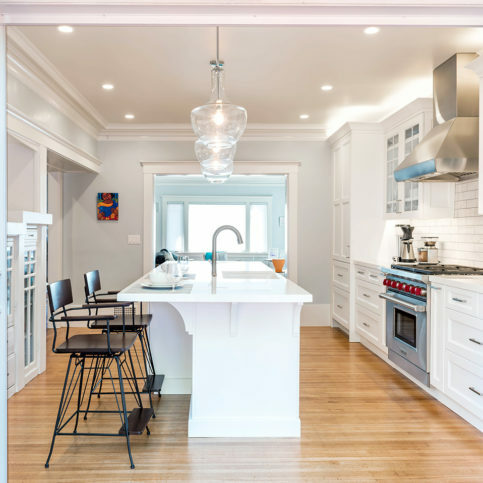 While the cost of a project should be part of the many criteria on which you weigh your options—along with the quality of the materials, the experience of the workers, the customer service and the electrician’s ability to understand and work to meet local building codes. Remember, higher-priced electrician services may even be a signal that the commercial electrician you are considering is more experienced and therefore can provide better quality work in a shorter amount of time. So take the time to weigh each Alameda County commercial electrical service on its own merits, and ask for detailed and itemized bids that allow you to compare the details of each company’s services. Industrial electrical experts can install, repair and maintain electrical systems in industrial buildings including factories, power plants, chemical plants, mines, production facilities, automotive factory, high voltage areas and in other industrial work areas. Industrial electrical companies also can repair and maintain electrical equipment, such as motors, industrial robots, high voltage electrical systems, circuits, electrical instruments and machinery. If you own a factory, production facility, plant or other industrial building in Pleasanton, Berkeley, Union City, San Leandro and Alameda or another part of Alameda County, you may want to hire an industrial electrician to perform maintenance, repairs and installation. These contractors will usually have more experience in industrial settings than commercial electricians, although some commercial electrical companies in Alameda County also have qualified industrial electricians on staff. Why Trust Diamond Certified Commercial Electrical Contractors Rated Highest in Quality and Helpful Expertise®? 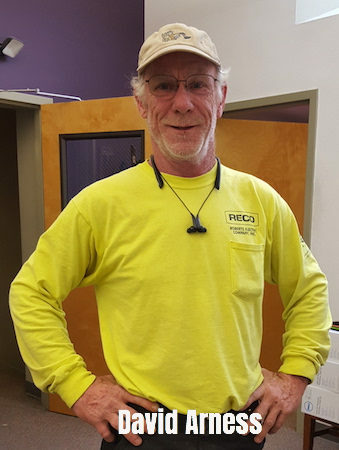 Dan Pitcock is a lifetime veteran of the electrical industry and president of Roberts Electric Company, Inc., a Diamond Certified company since 2002. He can be reached at (510) 621-3918 or by email. Long before he was supplying the muscle at rock ‘n’ roll shows, Dan was fully immersed in electrical work. As he describes, it was merely a family affair. “I come from a family of electricians, including my father and my uncles. My parents started Roberts Electric Company in 1960, and I basically grew up in the business. By the time I was 12, I was working during the summers for my parents, and I continued to do that through college. In 1992, I took over the business.” In addition to building on the traditions of quality and service that have characterized Roberts Electric Company since its inception, Dan has put his own spin on things by expanding the business to handle larger commercial and industrial jobs. A: Even though I grew up in Oakland, I’ve always been a Giants and 49ers guy. And, of course, I have to support my Cal Bears. A: I like a mix of old school and new school. Lately, I’ve been listening to a lot of newer stuff like Arcade Fire and Band of Horses, but I also like Led Zeppelin and the classic rock I grew up with. I’m just a child of the ’70s who has lived through all these different phases and learned to appreciate newer styles. I’ve even warmed up a bit to the rap music my son listens to! A: I’d go to the past, because I’d like to see the Bay Area before it became settled and populated. When the first Spanish explorers came through here, they described all kinds of amazing things—whales beached on the Bay, grizzly bears, and huge amounts of birds and fish. A: I’ve always enjoyed sci-fi and fantasy books—I used to read the Lord of the Rings trilogy every year—but lately, I’ve been reading historical accounts of life in the United States. A: I’m a big taco truck guy. Oakland has some great taco trucks, so when I’m in the mood, I enjoy a good local taco. A: Organic roses. The ones that aren’t hybridized have a really amazing perfume. 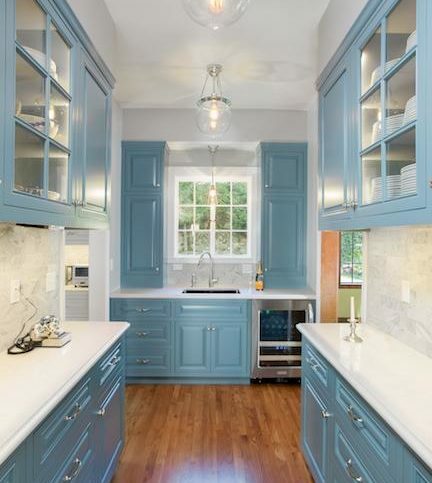 This kitchen was featured on the 2016 Heart of the Home Tour. For this complex project at Alameda’s largest estate, Roberts Electric Company needed to move the transformer onto the project site. 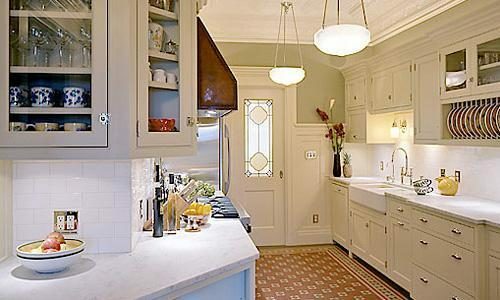 Unusual for a residence, it required extensive coordination with the local utility and the City. Roberts Electric Company rewired this REMMIE award-winning living area, which was created by switching the dining room and the kitchen. 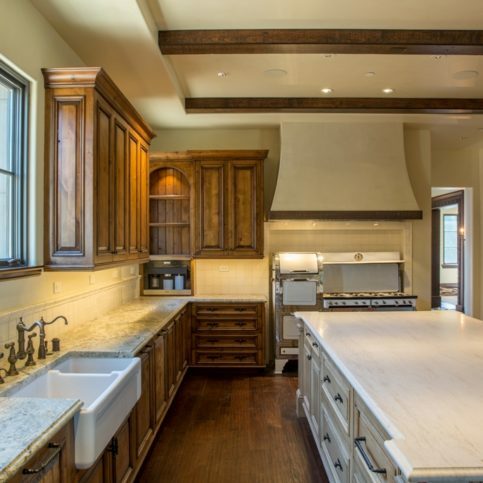 RECO installed LED lights and dramatic fixtures to showcase the hardwood floors in this kitchen. 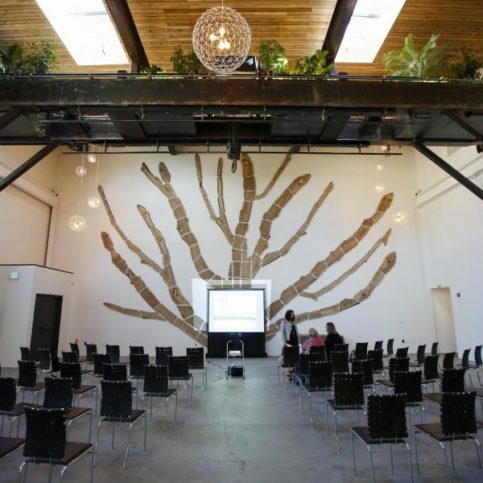 RECO was the electrical contractor for The Pearl, San Francisco’s premier event space. 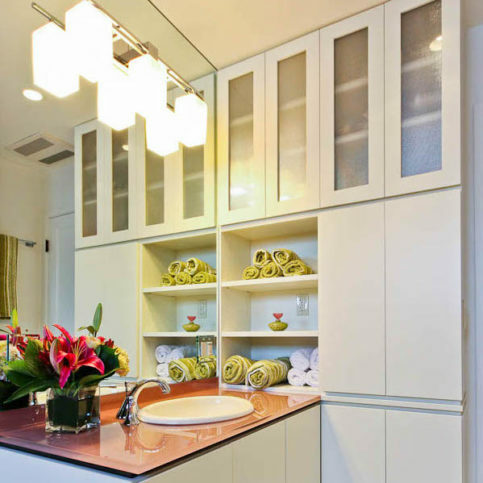 This customized bathroom is notable for its built-in storage cabinets, dramatic LED lighting and bright orange countertop—a 3/4-inch piece of glass with the color sprayed on the bottom. 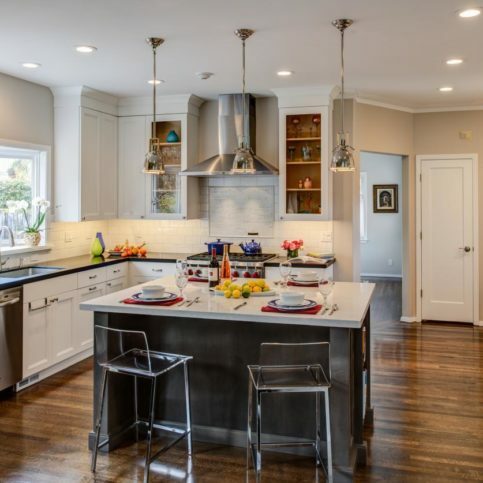 Roberts Electric Company teamed with Buestad Construction on an extensive remodel of Alameda’s largest estate, a project that lasted for most of a year. 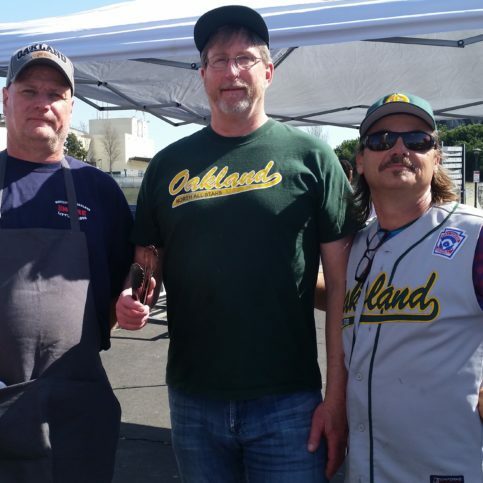 Owner Dan Pitcock (middle) grew up in Oakland and remains active in the community. He coaches softball and is on the Boards of Oakland Field of Dreams and Oakland Parks and Recreation Foundation. 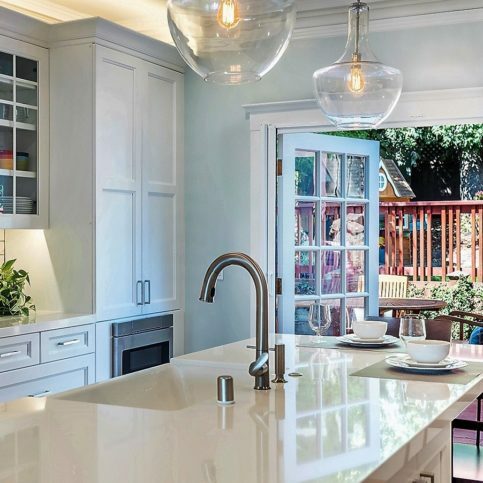 For this Piedmont REMMIE award winner, Roberts Electric Company installed Kichler pendant lights over the island, which have become some of the top-trending lighting fixtures on Build.com. 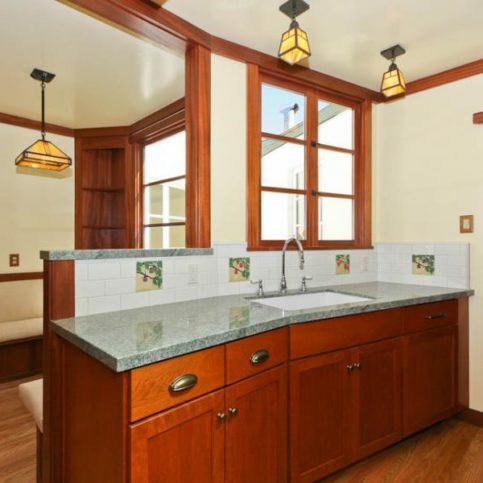 RECO rewired this two-bedroom craftsman cottage in San Francisco and installed LED lights to highlight the African mahogany. 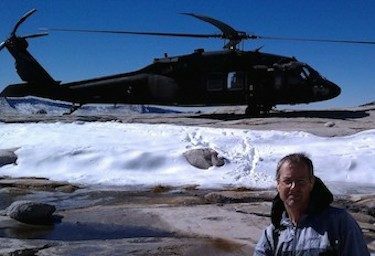 Jeremiah Kost, a longtime leader and client favorite in Roberts Electric Company’s residential division, is a Search and Rescue (SAR) volunteer with the Contra Costa County Sheriff’s Office—on call 24/7 throughout the state. 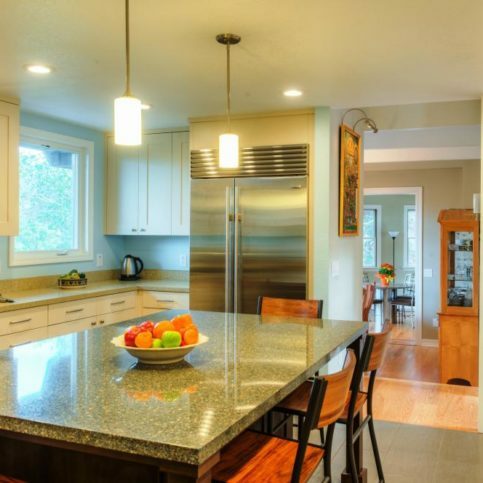 Roberts Electric Company was the electrical contractor for this craftsman-style home that won a REMMIE award. The owners of the 100-year-old craftsman wanted a new kitchen that restored the home’s original character. 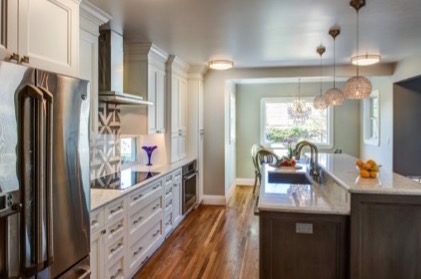 RECO performed extensive rewiring in this kitchen to make it more livable for a busy Oakland family. 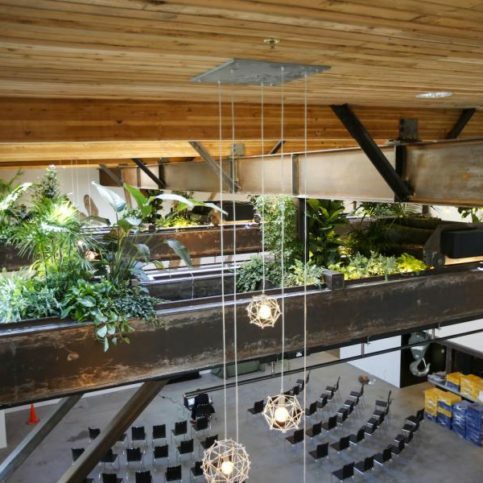 RECO’s work on The Pearl in San Francisco included showcasing the hanging living garden with unique fixtures and LED lighting. RECO can evaluate the energy efficiency of clients’ electrical systems. The Roberts Electric Company team is divided among residential, commercial and industrial divisions. 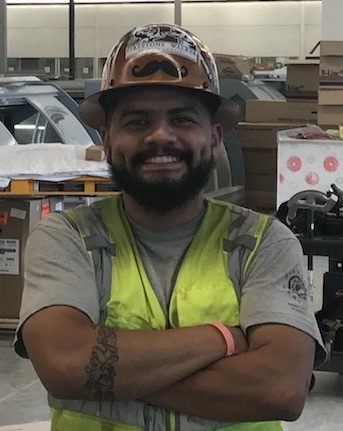 Francisco Hernandez is an apprentice at Roberts Electric Company and hopes to take the test to become a licensed electrician in 2018—he needs 8,000 hours of experience. Francisco has worked on some of the company’s most complex, high-profile commercial projects. 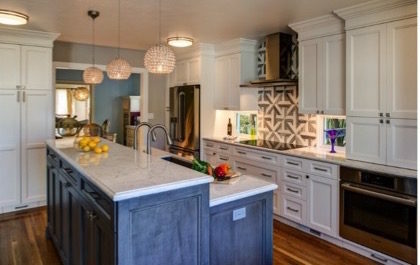 Roberts Electric Company rewired this REMMIE award-winning kitchen and installed energy-efficient LED lighting and dramatic Kichler pendant lights over the island. 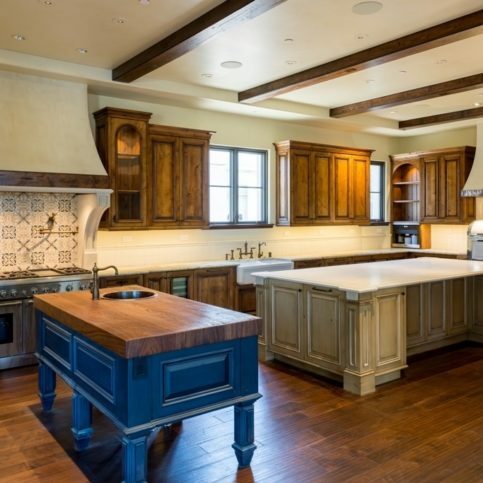 For this REMMIE award winner, Roberts Electric Company worked closely with the contractor and architect to provide a modern lighting schematic that blended with the 100-year-old craftsman design. 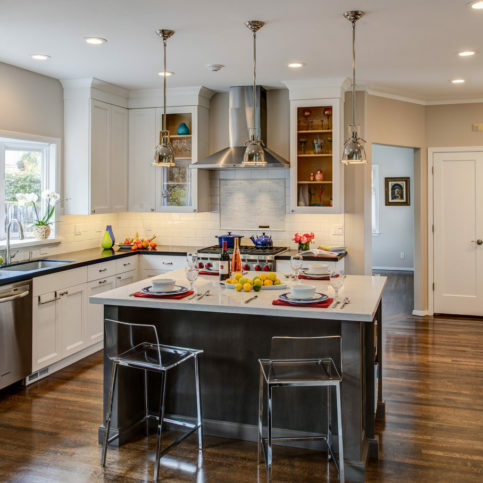 Roberts Electric Company worked closely with the homeowner and contractor on this Berkeley kitchen to create a more open living space. 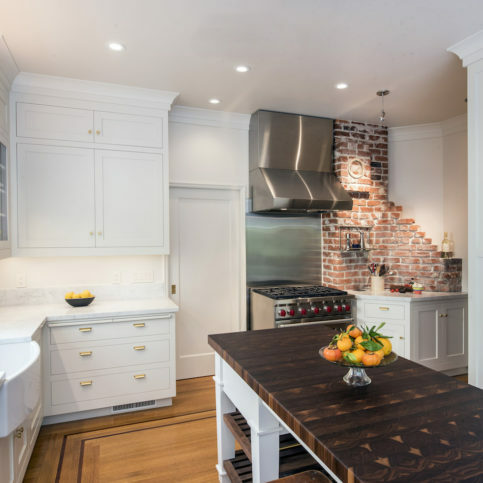 Roberts Electric Company rewired this Berkeley kitchen and living area and installed energy-efficient LED lighting to illuminate workspaces. David Arness joined Roberts Electric Company in 2014. David has an MFA and works primarily on commercial projects. 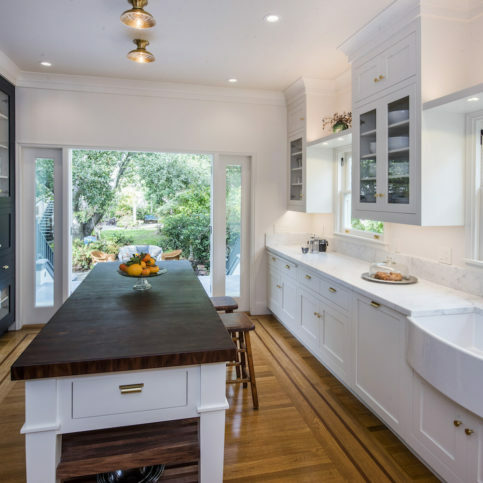 For this Berkeley kitchen, Roberts Electric Company worked closely with the owner and contractor to rewire the entire living area that was opened up to create a brighter, lighter, more livable space. The following agencies and associations are those that deal with licensing, regulating and giving information to and about commercial electrical contractors. They may be able to provide more information about commercial electricians in your area to supplement the helpful articles above. It may also be true that commercial electrical services affiliated with some of the agencies below may be able to offer better services. Being licensed by or a member of local and national commercial contracting associations may show that a contractor has a deeper commitment to providing quality work and continually increasing their knowledge about the newest advances in and best practices for commercial electrical services. Start your search by outlining your needs. Think about the specifics of your building and business, the current electrical system and lighting, complaints or problems you’ve had with the existing system, and the commercial electrical services you need. You should also consider what you expect professionally and personally from the Alameda County commercial electricians you hire in Oakland, Dublin, Fremont, Newark and Hayward and beyond. Start by asking yourself the following questions and any others that pertain to your situation, and writing down the answers so you can keep a record of your exact needs, expectations and desires. Do I want a Diamond Certified commercial electrical contracting company that is top rated and backed by the Diamond Certified Performance Guarantee? What commercial electrical services do I need (electrical system repairs, new construction electrical installation for a commercial building, store rewiring, public building lighting, commercial building power system upgrades, etc.)? What is my budget for my commercial electrical installation or repairs? Are there any items that need to be considered when planning the electrical repairs or service? (These may include business or store operating hours, notifying tenants, set timeline for repairs, specialty licenses, code violation repairs, etc). What qualities do I want in Alameda County commercial electricians? Personal and professional characteristics you may be looking for might include experience, timeliness, cleanliness, good communication skills, knowledge, experience, and follow-up service). After your phone interviews are completed, read over the notes you took. Think about the first impression the local commercial electrical companies left you with. You should easily be able to narrow down your list of potential contractors. The next step is to invite a few of the stand-out commercial electricians in Alameda County to come to your location to provide an estimate for the commercial electrical repairs or installation you need, whether your business is in a larger locale such as Pleasanton, Berkeley, Union City, San Leandro and Alameda, or Livermore, Piedmont, Russell City, Emeryville, Cherryland, Sunol and the Tri-Valley, or another area. This will give you a chance to show your commercial space to the electricians you are considering, and it will let them see the scope of work and the existing materials. As with the telephone interviews you conducted, you’ll want to have a written list of questions that you pose to each commercial electrical company, and you’ll want to write down the answers you get so you can compare them. The list of questions below are some you can use to augment your own questions. What commercial electrical services would you suggest for my office? How long will the commercial electrical services I need take to complete? Will I be able to stay in this building during the rewiring/installation/repairs? Or will the electricity be shut off for too long to enable our employees to keep working or our customers to continue shopping? Can you provide off-hours commercial electrical repairs so that the work won’t impact my business, employees or customers? Have you completed similar commercial electrical work in my area of Alameda County? How do you finish commercial electrical installations and repairs? Will you return my commercial building to the condition it was in before you did the work, or will I need to hire another contractor to repair walls, paint or provide other services? Will you help us set up an electrical maintenance and assessment schedule so that our building continues to comply with local codes and safety standards for commercial buildings? Will you be responsible for providing warranty work if there’s ever a problem with my new commercial electrical wiring and/or fixtures? Is there anything I can do to make the commercial electrical repairs and installation process go smoother? It’s best to choose a Diamond Certified commercial electrician because all certified companies have passed an in-depth ratings process that most other companies can’t pass. If you want quality from a commercial electricians in Alameda County and the Greater Bay Area, you can have confidence choosing a Diamond Certified company. Diamond Certified reports are available online for all certified companies, including commercial electricians in San Leandro, Berkeley, Hayward, Alameda, Fremont and Oakland, and beyond. And you’ll never be fooled by fake reviews. That’s because all research is performed in live telephone interviews of actual customers. If you can’t find a Diamond Certified commercial electricians within reach, you’ll have to do some research on your own. If you do, it’s wise to call some references provided by your commercial electrical companies. Remember, though, references provided to you by the commercial electricians are never equal in value to the large random sample of customers surveyed during the Diamond Certified ratings process. That’s because references given to customers from companies are cherry-picked instead of randomly selected from all their customers. So the commercial electrical contractors you contact will likely give you the names of a few references that they know are satisfied. If you do call references on your own, specifically ask for a list of the commercial electrical company’s 10 most recent customers. This will help avoid them giving you the names of only customers they know were satisfied. Were you satisfied with the service from_(Alameda County commercial electrical company name)_? What was the type and scope of job they did for you (emergency electrical repairs in your commercial building, electrical rewiring for your store or shopping center, indoor or outdoor lighting installation, fuse replacement, electrical panel service, etc.)? Did the commercial electrician explain the status of the work while he was working on your office or commercial building? Did this commercial electrical firm complete the electrical repairs or installation on time? Did the commercial electrical repairs or commercial electrical installation costs match the estimate you were given? Were there unexpected costs? If so, were they avoidable? Did the commercial electricians charge extra to travel to your business or office if it is located in Russell City, Komandorski Village, Cherryland, Albany, Castro Valley and Sunol, or a rural area? Did the commercial electrical contractors clean up after finishing the work? Would you recommend this commercial electrical service to friends or family? Before deciding on the best commercial electricians in Alameda County for you, take a moment to review your interview notes and consider the following questions. It may be helpful to review your notes from the interviews you performed and review any written materials or estimates you were given by the commercial electricians in Oakland, Fremont, Hayward, Berkeley, San Leandro, Alameda, Union City, Pleasanton, Newark and Dublin and the rest of Alameda County. Is there a commercial electrical contracting company on your list that can meet your needs for commercial electric services, commercial-scale electrical supplies and materials, brands and installation or repair requirements? Are the Alameda County commercial electricians you’ve spoken with knowledgeable about the repairs and new electrical wiring you need? Have they explained to you which products and brands best fit the needs of your store, shopping center, public building or commercial site? Are the local commercial electrical contractors you’ve interviewed sensitive to your budget? Can they give you bids with options that fit your resources? There many good commercial electricians that operate in and around Alameda County, including those that serve commercial customers in Pleasanton, Berkeley, Union City, San Leandro and Alameda, and other areas. You may be surprised to learn that contractors can be just as discerning about with whom they work as can business owners. That’s because bids take time and can be expensive to prepare, so commercial electricians may only choose to provide bids to and work with commercial building managers and business owners who are serious about hiring quality commercial electrical contractors, not just those who offer cheap electrical services for businesses. The following tips are just a few that help you be the kind of customer that Alameda County commercial electrical services want to work for. Look for commercial electricians that provide good value and quality electrical services for commercial buildings, not just contractors that offer the lowest bid. Show your interest in quality commercial electrical services by asking questions about products, repair methods, installation techniques, warranties and lasting value rather than simply price. Tell the commercial electrical contractors exactly what you want done and any special requests that you have. This will give them insight into exactly what you want, and it will enable them to give you more accurate bids. It’s also smart to be upfront about your needs and expectations so that you can find out right away if the Alameda County commercial electricians you’re interviewing can’t can’t provide what you need or want. Interview local commercial electricians in Alameda County or your area. Most good commercial electrical companies like to work within an area that’s close to their home base, as this may allow them to be able to provide faster service and more reliable emergency repairs to their customers. (Be wary of electricians who travel across state lines or long distances to provide commercial electrical services. This is sometimes a clue that they will only provide initial installation services and may not be willing or able to provide repairs, warranty work or follow-up services). Be upfront with the commercial electrical contractors if you’re accepting multiple bids. But protect yourself and your interests by only shopping among licensed and insured companies that offer quality work and aim for three to five bids. Giving low-performing or unlicensed operators a chance to bid for your job or accepting too many bids can keep good companies from being interested in bidding for the work because they may feel they can’t compete on an uneven playing field). Once you’ve chosen a local commercial electrician, you’ll want to ask for a detailed estimate. Once that meets your approval, you should request a contract. Complete contracts for commercial electrical services will include the total price for labor and materials, the start date, the expected end date, and any special requests or requirements from you and your contractor. Warranties on the materials and any guarantees provided by your contractor should also be included in the written contract. Read through the estimate and contract to be sure you understand all terms as they are presented. Clear up any questions and add any remarks or requirements of your own before you sign the contract. For your own protection, never sign an incomplete or blank estimate or one that includes items with which you don’t agree or don’t understand. There are a few things you can do before the commercial electricians arrive and while they’re working in your business in order to help the work move along more smoothly. You may find that this can help the work go faster, and it may even save you money by eliminating costly or time-consuming work stoppages or distractions. Make a list of specific repairs or electrical installation work you need done, and write down any questions or concerns you want to address with the commercial electricians you’ve hired. This will ensure you get the service and answers you need and may cut down the length of time the job takes, reducing billable hours. Clear unnecessary items from the area in which the commercial electrical contractor will be working. For example, if your electrician will be repairing or installing a new electrical panel in your office, make sure he or she has easy access to the existing panel by moving furniture or other objects that are in the way. This will cut down on the amount of time your contractor has to spend clearing the area in which they’re working. Find out if you need to provide special parking space for oversized work vehicles or storage room for electrical supplies while the work is in progress. Have your office, store, shopping center or commercial building prepared for construction dust and debris if you’re having major commercial electrical work done. Dust, debris and other construction remnants can be tracked from the area under renovation into other space. If your commercial electrician will have to drill into walls or ceilings, open walls or ceilings or perform repairs or installation that can generate dust or debris, ask about having the electrical company or a third party put up barriers to keep out contaminants. Keep employees and customers out of the area while the work is ongoing. For projects that take more than one day, such as office rewiring or work station electrical upgrades, your electrician may have to leave wires exposed or walls opened. Talk with your Alameda County commercial electrical contractor about the duration of the job and his or her preferences; you may need to cordon off areas to keep out customers or employees for safety’s sake. Ask your commercial electrical company representative what you can do to help speed the job along. There may be simple steps you can take to increase the contractors’ efficiency, thereby cutting down on the amount of time spent and the overall cost of the job. How Can You Be a Good Commercial Electrical Services Customer? It’s your commercial electrician’s responsibility to install quality electrical materials using the best possible installation techniques for commercial and public buildings. But you play a big part in the success of your commercial electricians, too. You should start by performing license and insurance checks on the Alameda County commercial electricians in Oakland, Dublin, Fremont, Newark and Hayward or your area. Next, you’ll want to interview representatives of the commercial electrical services, and invite them to bid on the work you need done. Once you find the company that best suits your needs and sign a contract, you become partners in the work. Here are a few simple steps you can take to be a good customer when hiring Alameda County commercial electrical companies. Be clear and upfront with the commercial electricians. Let them know what you want from your commercial electricians, the long-term outcome you’re expecting and specific ways they can satisfy your expectations. Remember, a friendly smile goes a long way in gaining trust and maintaining a good working relationship, especially when there are conflicts or disagreements. Before you hire a commercial electricians in Alameda County, restate your expectations and goals, and reiterate to the commercial electrician your understanding of the agreement. Most problems with local commercial electrical services occur because of a breakdown in communication. By being clear about your expectations and theirs, you can avoid most conflicts. Ask your commercial electrical company if you should call to check on the progress or if he will call you with updates. Be sure your service representative has a phone number where they can reach you at all times while they’re repairing, installing or upgrading your business electrical system. The work will move along more smoothly if your commercial electricians can reach you for any necessary updates, questions or work authorizations. When your contractor contacts you, return calls promptly to keep the commercial electrical work on schedule. Pay for the commercial electrical services promptly. Why would you want to be a good customer? Commercial electricians in Alameda County appreciate customers who are straightforward, honest and easy to work with. Good customers can help make the process easy, and are often a pleasure to do work for. Your good customer behavior sets the tone from your end and creates an environment conducive to a good relationship with your commercial electrical contractor. The electrical repairs or electrical system installation may very well go more easily and any problems may be more quickly resolved. Ask the commercial electrician who worked on your project to walk you through the completed work. Ask them to show you the items on the invoice, point-by-point. Now is the time to ask about any discrepancies or questions you have about the information on the invoice or the work itself. The Alameda County commercial electrical company’s name, business address and license number. The total cost of the job, separated into amounts due for electrical parts, lighting, wiring and for labor. Any guarantees or warranties offered by the electrical equipment manufacturers and the installers. Warranties protect you, your business and your commercial electrician by stating exactly which products and services are under warranty and what will be done and by whom to remedy the problem in the event of a product or installation failure. Warranties or guarantees may be offered by the product manufacturer or by the commercial electrician who installs the products, and sometimes products and services are guaranteed by both parties. For your protection, you should have your Alameda County commercial electrical contractor explain to you the warranties on each product and service they provide, and outline who is responsible for any required warranty work. You may also want to get clarification on any maintenance, inspections or responsibilities you are required to provide in order to keep those guarantees valid. Likewise, you should know who to contact and what steps to take in the event of a product or installation failure. This may be especially important if your commercial building is located in Piedmont, Dublin, Mount Eden, San Lorenzo and Ashland, or a more rural area in which it may be harder to get follow-up service. As with any contract document, you should ask for all warranties in writing so that you have proof of warranty and written documentation of the responsible party if you need to redeem your warranty for any reason. The name of your Alameda County commercial electrical company, the business address and the contractors’ state license number. Details about which electrical products and work are covered and how the commercial electrical contractor will deal with warranty claims (full refund, product replacement or repair of faulty wiring, etc.). Your responsibility when filing warranty claims (i.e., whether you have to pay a prorated amount, cover the cost of labor, pay for new materials or fixtures, etc.). The exact terms and limitations of the warranty. Whether the warranty is transferable. Commercial electrical installers in Alameda County, including those that serve business clients in Dublin, Newark, Pleasanton, Union City and Alameda, and your area, are usually able to tailor their services to meet their customers’ needs. However, some commercial electrical services are more common than others. The following services are those that commercial electricians in Alameda County and the Greater Bay Area provide with regularity. Commercial electrical upgrades include new electrical panels, upgraded electrical wiring for businesses and stores, upgrades and installation of additional power outlets for employee work stations. Commercial electrical upgrades may also include additional lighting and electrical displays for storefronts and shopping centers. Electrical buildings require different electrical system designs than do residential areas and industrial electrical systems. That’s because commercial buildings have different electrical needs depending on whether they host office employees, shoppers, the public, or other individuals, and if those people are working, shopping, using computers, there for entertainment reasons, or have other needs. Some Alameda County commercial electricians specialize in designing commercial electrical systems that meet the needs of various commercial buildings and their employees and patrons. Most residential electricians aren’t experienced or skilled in dealing with high voltage electrical systems. However, commercial electrical services in Alameda County may be able to do so, as commercial buildings and public buildings are more likely to have high voltage electrical systems. These are also be common in industrial buildings, and are installed and repaired by commercial and industrial electricians. Building codes are different for residential and commercial buildings, and many commercial buildings have routine electrical safety inspections. These can be performed to ensure the commercial electrical system is in good working order, to delay major repairs by performing regular maintenance, to pass local operating regulations, and to protect employees and customers. Alameda County commercial electricians often provide 24-hour emergency electrical services for businesses and commercial buildings. These can include commercial wiring repairs, commercial or shopping center power outage repairs, and other public building electric repairs after-hours. Office buildings and commercial spaces require unique lighting depending on whether the building is an office or work space, a store, a mixed-use building, public building or has another use. Some local commercial electrical services in Alameda County, including those in San Leandro, Berkeley, Hayward, Alameda, Fremont and Oakland, and beyond, can provide lighting design for commercial spaces and office buildings so that the lighting sources match the need of the occupants. Electrical repairs for commercial buildings in Alameda County include wiring repair, commercial lighting repair, commercial electrical panel repairs, electric infrastructure repair, main electric line repair and replacement, outlet repairs and electric switch repairs. Commercial buildings often incorporate low voltage lighting, both indoor and outdoor. Some Alameda County commercial electrical contractors can install and repair low voltage lighting such as ceiling lights, outdoor and landscape lighting, accent lighting and low voltage work lighting. Office workplaces require different lighting than do shopping centers, mixed-use buildings, storefronts and industrial buildings. Alameda County commercial electricians can install lighting—including workstation lighting, direct lighting, accent lighting, lighting dimmer switches, aim-able lights and programmable lighting—that helps make employees more productive. Whether you are upgrading your entire commercial office space or simply want to upgrade dated or underperforming wiring, chances are good that a good commercial electrician in Alameda County can provide the services you need. Commercial electrical wiring upgrades may include the installation of new wiring systems, the addition of more electrical wiring, new electrical panels, adding more power outlets or upgrading the amount of power available. Good commercial electricians in Alameda County use a wide variety of materials from a number of name-brand electronics manufacturers. Some of the most common brands chosen are listed below. However, your commercial electrical contractor should be able to tell you which brands he or she recommends for your specific building and need. The terms and definitions below are some used by local commercial electrical contractors and commercial electricians. They pertain to services and products delivered by commercial and industrial electricians, as well as some general electrical terms that all business owners should be familiar with. Of course, this list will not include all terms or definitions you may want to know regarding commercial electrical work. As with any construction project, ask your commercial electrical services for clarification if there are any terms, materials, line item entries or other information you don’t understand about your project. As the customer, it is your right to completely understand the commercial electrical repairs, installations or services your office or commercial building needs. Accent lighting is decorative lighting that provides variable degrees of brightness and may distribute light in multiple directions to emphasize building aspects or illuminate dark areas of offices and commercial buildings. 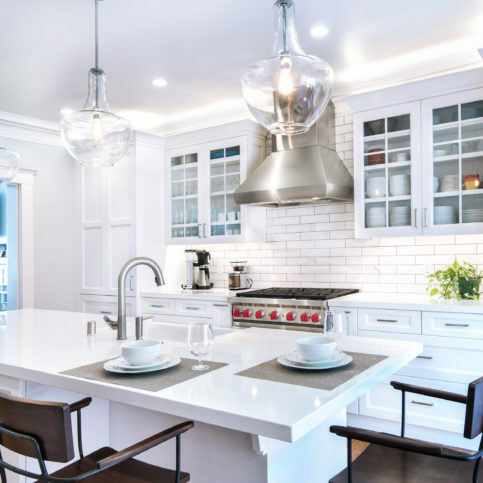 Common accent lighting methods include recessed lighting, track lighting and other aimed accent lighting sources that can be changed to suit employee or customer needs. Alternating current changes direction with regular frequency is known as alternating current, or AC power. Most industrial lighting, commercial lighting and business power is in the form of AC or alternating current. A term used to describe the reduction in power or voltage when the demand for electricity exceeds the amount of electricity available or being generated. Brownouts are usually minor reductions in power that customers and employees don’t notice; however, some brownouts may affect sensitive electronics. Blackouts are caused by a lack of power, usually when demand exceeds available power to the point where the power is completely sapped. Blackouts, including rolling blackouts, may occur in summer when temperatures are high and the power drain on the power grid is too high for the electrical system to sustain power. Cables, wires and conductors used in commercial building construction to provide electrical power to the entire building. Circuit breakers are panels built into offices and public buildings that allow for the opening and closing of a circuit. These may be used to turn off sections of power or turn on areas that have been overloaded and tripped by too-high energy usage. Commercial lighting services include repair, installation and rewiring for commercial buildings such as businesses, industrial buildings, restaurants, stores, public buildings, schools and other business buildings. Commercial lighting may be present inside the building (in the form of ceiling lights, work lights, office space lighting, decorative lighting, storefront lighting and display lighting) and outside the building (outdoor lighting, walkway lighting, decorative landscape lighting, and parking lot lighting). A type of fluorescent light bulb used in commercial buildings, industrial buildings and businesses. CFLs are energy efficient bulbs that fit most existing light fixtures created for traditional incandescent light bulbs. Commercial buildings, stores, businesses and office buildings often make the transition to compact fluorescent light bulbs in order to lower lighting costs. Electrical generators convert mechanical energy into electrical energy. Electrical generators are typically used as secondary power supplies and emergency power sources in the event of power failures. Some businesses and public buildings have secondary power in the form of electrical generators to allow employees to keep working and public use of their building in the event of an power outage. Problem-solving and troubleshooting services to find and identify problems within a commercial electrical system. Industrial electricians serve non-residential buildings such as factories, power plants, chemical plants, production facilities, mines and manufacturing facilities. They are usually skilled with high voltage power systems, machinery repair, circuits and electrical instrumentation, along with electrical wiring, electrical installation and repairs for industrial buildings. An inverter is a device designed to convert direct current into alternating current of any required voltage and frequency. Inverters are commonly used to take power from fuel cells, solar panels and batteries and turn it into usable AC electricity for businesses, schools, stores and public buildings. The term kilowatt hour refers to the amount of energy equal to the use of one thousand watts for one hour. Kilowatt hours are the most common billing unit for home electric usage. A watt is a measurement of power equal to one joule per second. Watts are broken into submultiples and multiples, including fetowatt, picowatt, nanowatt, microwatt, nilliwatt, kilowatt, megawatt, gigawatt, terawatt and petawatt. Power equal to one watt operating for one hour. A network of wire, conductors and devices that conduct electricity throughout buildings, schools, public offices and stores. The following questions are commonly asked of and about commercial electricians in the Greater Bay Area. Q: Why hire Diamond Certified commercial electricians? A: Diamond Certified helps you choose local commercial electricians with confidence by offering a list of top rated local commercial electrical contractors that have passed the country’s most in-depth rating process. Only commercial electricians rated Highest in Quality and Helpful Expertise® earn the prestigious Diamond Certified award. Most companies can’t pass the ratings. American Ratings Corporation also monitors every Diamond Certified company with ongoing research and ratings. And your purchase is backed by the Diamond Certified Performance Guarantee, so you’ll feel confident choosing a Diamond Certified commercial electrical service. Q: How is commercial electrical work different than residential electrical services? A: Commercial electricians provide electrical installations, repairs and monitoring in commercial locations such as stores, offices, public buildings, schools and other non-residential settings. Commercial electricians can provide lighting, new power outlets, upgrades for commercial electrical systems and other wiring and electrical work in commercial settings. Q: Can any electrician provide industrial or commercial electrical work? A: Commercial electricians and industrial electricians are trained differently than those who work in residential environments. Likewise, electric codes are different for commercial spaces. Some local electricians may be able to provide all types of electrical repairs and installations, but you’ll want to verify that your local electrical repair service has experience and skill working with the type of commercial or industrial electrical work you need done. It would be wise to call some references who had similar work done to find out how the company performed and whether they have a record of providing the services you need. Q: What is an industrial electrician? A: Like commercial electricians, industrial electricians serve non-residential buildings. Industrial electrical services provide wiring, electrical installation and repairs for factories, power plants, chemical plants, mines, production facilities, high voltage machinery systems and in other industrial work areas. Some industrial electrical contractors work with high voltage power systems. While commercial electricians provide general power services and lighting installation, industrial electricians often work with motors, circuits and electrical instruments. Q: Can commercial electricians provide lighting design and installation for my shopping center or office building? A: Lighting for offices, shopping centers, stores, mixed-use buildings and other non-residential spaces needs to be designed around the intended use of the building. For example, work spaces and offices need balanced overall lighting as well as focused task lighting for desks and work areas, and shopping centers and stores need decorative lighting and accent lighting that draws the consumers’ eyes to the merchandise. Many commercial electricians are able to provide lighting design and special lighting installations that complement the work space or shopping space. If lighting design is a service you need, ask the commercial electricians you’re interviewing if commercial lighting design is a service they can provide. You may also want to ask for the contact information for a few references who have had the commercial electrical installers provide for them commercial lighting design services so you can get a third-party account of the contractors’ abilities in that area.